The range trading that gold is currently facing reflects number of challenges, some of which were also present throughout 2017. First, the vast majority of professional investors are continuing to focus on equity markets, despite the volatility spikes we have seen at times this year. Second, rising bond yields are pushing up the opportunity cost of holding gold. Third, after trending down for much of last year, the US dollar has recently been more resilient. Lastly, ongoing rate hikes by the US Federal Reserve Bank remain a negative factor for gold. Together, these factors are likely to limit gold’s upside in the near term. Let’s look at the “challenges” that Gold Focus 2018 lists. Yes, the stock market has nearly everyone’s attention. However, it is no longer posting gains nearly every month as it did from November 2016 through January 2018. One day, the Dow Industrials fluctuated 1600 points; 300-, 400- and 500-point swings became commonplace. Those were days that cause investors to seek safe havens, such as gold, and it moved to the upside, from the $1242 level in mid-December to $1358 in late January. Gold tacked on more than $100 in six weeks. That’s what happens when stock investors get scared. What they’re saying here is that gold pays no interest and that the interest you’re not receiving while in gold is an “opportunity cost.” If you bought bonds, you’d receive interest. Here’s the problem with this reasoning: as interest rates rise, bond price decline. And, the Fed has made six consecutive interest rate hikes of .25% since December 2015. Further, the Fed has made it clear that their intentions are more rates hikes. “Normalization,” they call it. Buy bonds and watch their values fall as more Fed rate hikes are implemented. To “get your money back” from bonds in a rising interest rate market, you have to hold to maturity. But, with the official inflation rate at about 2% — and assuming it stays there for say five years – you lose 10% in purchasing power. Not a good bet. Gold, on the other hand, tends to gain in price during periods of rising inflation. #3: After trending down for much of last year, the US dollar has recently been more resilient. True, the dollar has risen (vs. a basket of other fiat currencies), and gold’s price rise has been checked, fluctuating in 2018 between $1,310 and a little above $1,350. What seems not to be considered is that this fiscal year (ending September 30) the federal government is projected to run a deficit of $804 billion. For fiscal 2019, the deficit is projected to top $1 trillion. And, nobody is talking about it. Tune in to Fox Business News, and you will have to listen a long time before anyone talks about the massive deficit spending, the $21 trillion national debt or that the new tax law alone is projected to add at least $1.5 trillion to the national debt over the next debate. Surely, those numbers should scare someone into buying gold. #4: Ongoing rate hikes by the US Federal Reserve Bank remain a negative factor for gold. Together, these factors are likely to limit gold’s upside in the near term. Why? Continued Fed rate hikes are going to be negative for stocks, not for gold. Higher interest rates will make capital expenditures more expensive, slowing an economic recovery that is struggling to grow at 3%. Further, the American consumer, which accounts for 70% of GDP, is tapped out in the debt market. The average American has a credit card balance of $6,375, up nearly 3 percent from last year. Further rate hikes will make carrying credit card debt still more expensive. While Metals Focus 2018 has stellar sponsors, one wonders what the objective is in painting gold in a negative light. Objectivity, they will probably say. But, the primary reason for owning gold is as a hedge against inflation, or probably more accurately, against the eventual destruction of the dollar and the rest of the world’s fiat currencies. Why didn’t they discuss the massive quantities of fiat currencies that have been printed since the 2008 Great Recession? 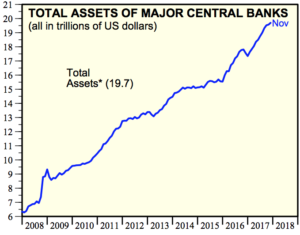 Do not forget that those $19.7 trillion in assets were bought with money created “out of thin air.” No one had to work to produce any goods or services. The money was simply printed. The creation of fiat currencies (not backed by anything but the “full faith and credit” of the issuers) is not an American phenomenon. The problem is worldwide and can result in a rush to gold in one country or in many countries. Because the Fed — and all other major central banks — play such important roles in the financial markets, let’s conclude with a quick look at the Three Steps and a Stumble rule that was developed by the legendary stock technician Edson Gould. Although margin requirements and reserve requirement are not much in the news nowadays, federal funds targets are. As noted above, the Fed has hiked interest rates six times since December 2015. Although stocks turned in huge gains in 2017, which saw three Fed rate hikes, stocks now have stalled. This simple rule remains relevant, and it tends to foretell stock market tops. Since the January top, three rallies in the DJIA all failed to better the top in the prior rally. A fourth rally may be failing to top the third rally. Not a good sign for stocks. Jared Dillian, editor of The Daily Dirtnap, put it another way a few weeks ago: “Something broke.” To Dillian, the trend has changed, and the way to play stocks is on the short side. Shorting stocks is not for the average investor. A better way to “short the stock market” is to own gold.